Starting off on a light note: if you watch a lot of YouTube videos, check out YouTube Rewind 2017 to see if you can spot your favorite creator or musician, and identify the popular memes. I recognized a few. And, yes, this is just a big ad for YouTube. YouTube CEO Susan Wojcicki made two announcements this week. She explained how YouTube is expanding their work against content that may “mislead, manipulate, harass, or harm”. They are hiring humans “to address content” that violates YouTube policy (aiming for 10,000 across Google), improving machine learning to detect violent extremism, hate speech, and threats to child safety. Along with that, greater transparency around flagged content. 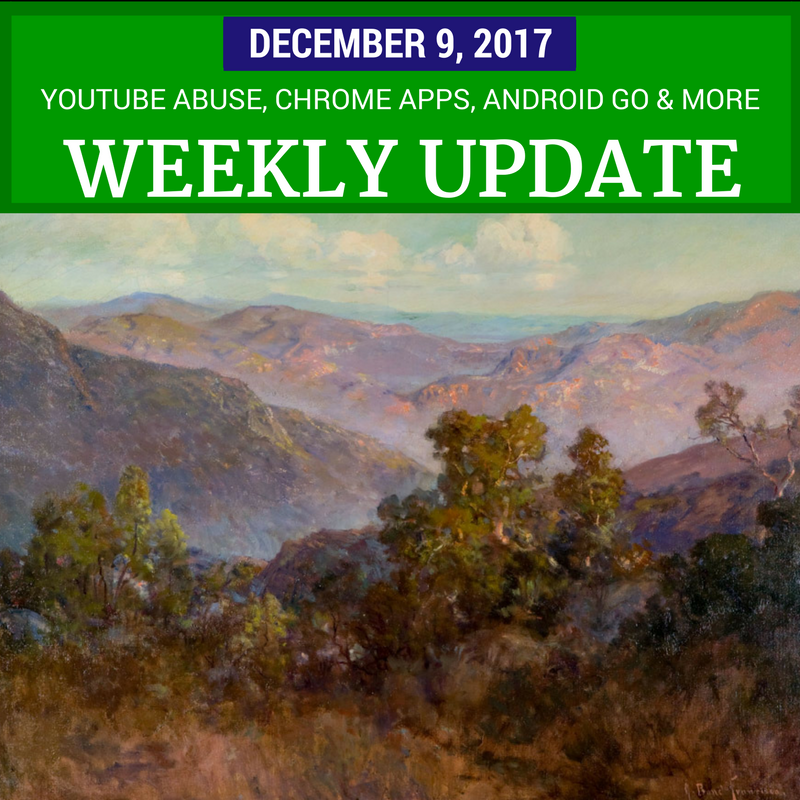 Wojcicki also addressed the Creator Community, promising there will be improvements to the systems that determine which videos can be monetized. They will be applying stricter criteria and more manual reviews by humans. While more channels that violate the Community Guidelines may be demonetized, hopefully this also means that channels with advertiser- and family-safe content should be less likely to be affected. There is bad news if you have an Amazon FireTV or Echo Show. Due to a dispute with Google YouTube will be pulled off the Fire TV and Echo Show as of January 1st. While it’s possible the two companies could come to an agreement before then, but I don’t think it’s very probable. Back in August 2016 Google announced that “in the second half of 2017” the Chrome web store would stop showing Apps for Windows, Mac, and Linux. This week they made good on that. Chrome will continue to load existing apps until “early 2018”. Chrome OS devices aren’t affected. In the mean time Google is working to bring bring Progressive Web Apps to the desktop. Along those lines, this week Google released the web app version of Chrome Remote Desktop (in beta). This week Google started rolling out Android 8.1 Oreo and Android Oreo (Go edition). The Go edition is optimized for entry-level devices, with improved memory usage and specially optimized Google “Go” apps (Assistant, YouTube, Maps, Gmail, Play, Chrome, and the new Files Go). T-Mobile, Sprint, and Verizon are deploying trucks with chargers, wifi access, loaner devices, water and snacks in Ventura and Los Angeles counties. Verizon is providing unlimited domestic talk, text and data to active customers in the affected Southern California zip codes.